FAERIELAND - The rising technological advances and the ever-apparent danger have made Cloud Racing an ever-more-so popular sport, though safety bars and cloud-bags making people feel at ease in their Racer can cause the condition and... well, the actual construction of their Racer to decrease. So how can you take care of your Racer to continue flying for another day? Firstly, there’s a reason Dark Faeries aren’t seen in public other than in Cloud Racing championships- they’re so busy fixing up their Racer from the last one! Dark faeries are notorious for using their “Power of Mind” for steering - but this is no example. The traditional way is to keep your hand on the steering wheel. This is arguably the best way to make the racer go the way you want to, unless you can intimidate the joysticks or have particularly macho brain waves. There are many means to oil your Cloud Racer and each Faerie swears by a different way. The Space Faerie insists on using the finest Grundo drool, though, understandably, many people are disgusted by this. Taelia puts a severe amount of time to making the finest puree of radioactive negg, though this is pricey and damaging at best. The Rainbow Fountain Faerie positively believes in finest salt water, though she has obviously never played “Chemistry for Beginners”. (It does cover Corrosion, right?) The Tooth Faerie in true dental spirit uses Neopia’s finest Peppermint Toothpaste. Whether this works if debatable, but her racer is sparkling white and free from cavities nevertheless. The rest of the Faeries have their own specified ways to oil up their racers for the smoothest ride, but we have found the most reliable way is the simple oil of the Bloop Trail. 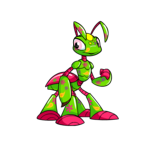 This can be found on the forest floor of the Haunted Woods and can also be used for Robot Petpets. You need to enjoy your racer to really know it. If the wings span for 300 feet, then some nimble boxing may be difficult, but you can work this to your advantage. From a safety and mechanical aspect, you should always be careful to get around trees. Barbats are very territorial if you destroy their nests and, though mindless, have very venomous spit and will dissolve the body on your racer. No matter how beautiful your racer is, it’s always good to be functional, so think of this when you’re creating your baby/partner/automotive/silly thing/future investment and life from the moment you get hooked to the sport like so many Neopians today. Where to practice your flying is vital to the well-being of your vehicle. If you have a fire-based mobile, for the love of Tarla, don’t practice in Terror Mountain! It is advised not to even go near Darigan as it can provoke an unwanted attack, and even to get there you would have to pass through Meri Acres Farm, and the smell could put off even the most steel-nosed of us, and air-borne Slorg remains from the recent defence of the plague are bad for the engines. Many experienced riders like to go to Lutari Island to get to a secluded area for concentrated practice, but no one should ever brave the mist, for the sake of the quivering Cloud Racer. A few good places to practice include the shores of Mystery Island; the sand there is so fine it will not clog the engines, but it is vital not to anger the locals as they whiz over the horizon. Kiko Lake is a wonderful alternative to Lutari Island, as it is just as secluded and it has plenty of much required band-aids and plasters. Just be careful of lost shoppers from the market day spillover in Neopia Central. The only perfect place to practice is Faerieland, but then that would give away your signature moves, and you can’t have that. 1)	The technological advances didn’t follow their own specially modified racers. 2)	The crowd lost interest as they couldn’t see the amusing faces they made as they almost crashed into a tree; they were always far too small. 3)	The most obvious reason - their fur gets everywhere! So that makes a reason in itself; don’t waste your time picking out Babaa wool from the Joystick bed. Don’t bring your Petpets in the cockpit! The levers and buttons will not be clogged and will last longer without this little inconvenience. There are lots of extensions now that can be put on to your racer; a far cry from the old days when eating a carrot on board was considered high-tech. Firstly it is not advised to install a speaker, as if you do have an accident, you don’t want to put it down to being occupied singing to “10000 feet above”. A recommended trait is the Feloreena resistant wings, as you don’t want their little horns to give you a wing puncture. Also, out of the market are some headlamps that cast a light so you can see whether the cloud you are about to steam through is a cloud or just a dozy Cirrus. This can save the life of many a petpet and save the shiny finish on the front of your racer. Under the frame of the racer things can sometimes go a bit neglected. Many racers don’t care; so long as pretty patterns are being emitted from the back of the exhaust, it doesn’t matter what goes on underneath the surface. So therefore they don’t understand. Meaning effectively you don’t have to care, so if you have a technical fault you may just blame it upon the fault that they don’t understand, so it must have happened! A bit of advice that will be handy in this area is to know what actually can go wrong so you know what to blame it on.